Brisbane Convention & Exhibition Centre (BCEC) General Manager, Bob O’Keeffe was appointed as a Member of the Order of Australia (AM) in this year’s Australia Day Awards for outstanding services to tourism and business in Queensland. Australia’s longest serving Convention Centre General Manager, Bob O’Keeffe has been at the helm of the award winning Brisbane Convention & Exhibition Centre since it opened in 1995 and has been witness to an extraordinary era of growth and success for both the Centre and Brisbane. More than 20,000 events including the hosting of the 2014 G20 Leaders’ Summit, putting Brisbane and Queensland at the centre of the world stage and 17.7 million people through the doors, the Centre continues its strong performance record delivering $4.5 billion into the Queensland economy. “Bob is one of Queensland’s longest serving business leaders, a great achievement in its own right. He is the reason that the Convention Centre has won 171 awards, which is more than five awards for every year he has been in charge. 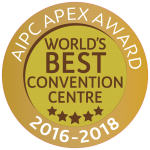 Our convention centre has been judged the world’s best in the AIPC APEX Awards 2016 – 2018. Upon receiving the award Bob O’Keeffe said he loved what he was doing and the industry he works in. “I am very proud to be recognised in this way for doing something I love. I am extremely humbled by this award and hope it helps to shine the spotlight on the importance of the Business Events Industry, which drives international visitors to our shores, showcasing Brisbane and Queensland to the world.” BCEC, he says, delivers some $300 million to the Queensland economy each year.